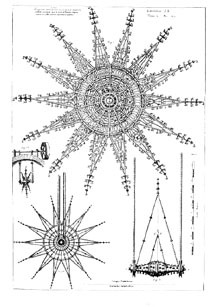 Kircher's best-remembered work is also his second largest. Musurgia Universalis is an exhaustive compendium of musical knowledge at the transition point between sacred renaissance polyphony and secular Baroque music. Much of Musurgia is dedicated to a survey of contemporary music, including the first published mention of the baroque 'doctrine of the affections' in which music is ideally analogous to human emotions. Many surviving compositions by Frescobaldi, Froberger and other baroque masters are due to Kircher's extensive transcriptions and reproductions of scores in Musurgia. Kircher speculates on the music of early cultures and reproduces a melody he claimed to have seen on a manuscript in Sicily dating back to ancient Greece, making it (if authentic) the oldest surviving example of musical notation. A large part of the book is devoted to the history of instrumentation, including the anatomy of voice and hearing, and an extensive theory on acoustics entitled 'Magia Phonocamptica, sive de Echo', in which he described sound as 'the ape of light'. Kircher professes the Boethian concept of musical harmonies' mathematical correspondences within the body, the heavens, and the natural world, and concludes with a discussion of the unheard music of the nine angelic choirs and the Holy Trinity. Kircher's research in music and acoustics led to many innovations and inventions, particularly in the area of amplification and sound design, which he would expand upon in his Phonurgia nova (Kempten 1673). Other devices created the illusion of talking statuary, hydraulically powered mechanical music-playing automata, the aeolian harp (which was revived and venerated by the English romantic poets as a model of divine inspiration), the hearing aid, and the arca musarithmica: a primitive mechanical computer that would compose simple random compositions, as well as write messages in cipher, calculate the date of Easter in any year, and design fortifications. Surviving examples of this device are held by the Museum of the History of Science in Florence and the Pepys Library at Magdalene College, Cambridge. To view this text in German, select this link.